With XTRA GRIP, we offer various anti-slip solutions for fall and slip prevention in the workspace and in public buildings. Falls due to slipping are still the second leading cause of all accidents in the workplace or in public spaces and buildings. The consequences range from a scare and embarrassment to fractures and serious injuries. Anti-slip solutions for stairs and floors are still the most efficient form of fall prevention. XTRA GRIP consists of a series of high-tech solutions to minimize slipping in various risk situations. 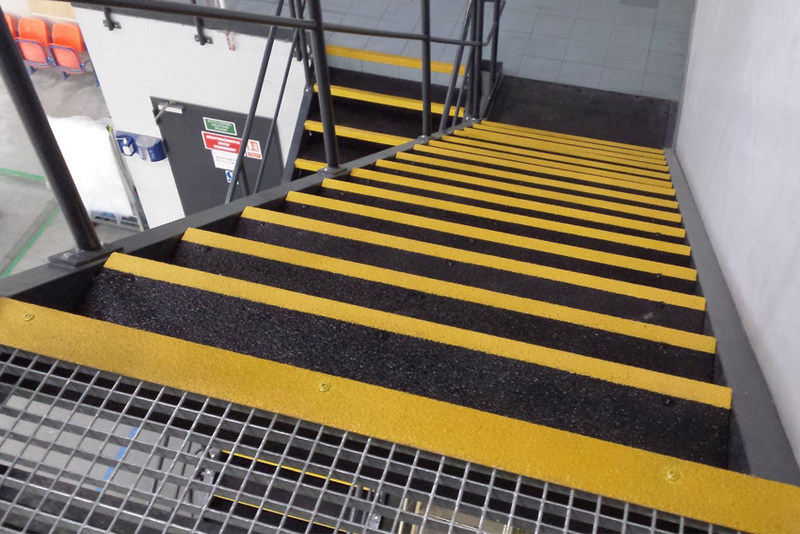 In our range of anti-slip steps, anti-slip floor slabs and anti-slip profiles, you are sure to find the most suitable anti-slip solutions for your staircases, ladders, catwalks, walkways, platforms, runways, working platforms, ramps, industrial floors and many other high-risk situations. All our XTRA GRIP solutions feature a tread surface consisting of several layers of rigid plastic with wear-free, moulded anti-slip pellets that will not come loose from regular traffic. Even wet conditions, the aggregate retains its safe, reliable, anti-slip effect. XTRA GRIP stands for a durable, impact-resistant, maintenance-free anti-slip tread that prevents falls due to slipping.